With 6 points and 6 colours of Winterkist it took a little bit of thinking to get it to work properly so that each flake had every colour, and the diagonal ones pointed to the opposite block’s colours on the diagonal, but I think I’ve cracked it now… I’ll reveal all when I get the top done completely, but that will have to be when I’m down at mum and dad’s because I don’t have a big enough space to lay it all out! It's gorgeous Katy – and a perfect match for the weather!! Oh your Winterkist quilt is going to be quite splendiferes!! Love those snowflakes. Can't wait to see what they look like in your quilt top. Ooo can't wait to see.. that is super cute Katy! I love Amy's pillow. What a lovely pattern. Oh fun! I can't wait to see it! Oh wow! Your quilt is going to be amazing! Ooh that's going to look great, looking forward to seeing it. I can't help but think of poor mum and dad tripping all over your patchworks spread out over the floor – bet they love your visits. Will be wonderful I am sure! Look forward to seeing it in all its glory. I'm intrigued and can't wait to see your version. Look forward to seeing your version, this is a pretty block. I love this pillow. I think I've had it pinned for a while now. Can't wait to see your spin on it! Your quilt is going to be excellent if you are adding these in. 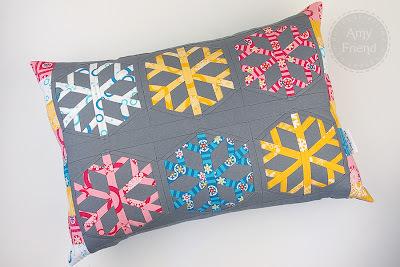 Love Amy's cushion and can't wait to see what you're doing with this pattern. So lovely! I know this comment is late. I'm trying to catch up with reading your blog!